The Boise, Idaho, medical center chose an online program for immediacy and to allow for a global point-earning opportunity. 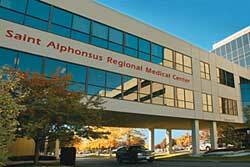 THE Saint Alphonsus Regional Medical Center in Boise, Idaho has a well-earned reputation for being an excellent place to work. In 2004, the hospital was the recipient of the National Quality Health Care Award given by the National Committee for Quality Health. Modeled after the prestigious Malcolm Baldrige Award, this award recognized the hospital for its excellent physicians and staff, its commitment to a healthy workforce, its dedication to using new and emerging technology to ensure patient safety, its innovative leadership, and its patient safety plan. The hospital also has a comprehensive package of employee benefits, including generous insurance plans, continuing education programs, adoption benefits, and child care discounts. But Derek Carassimi, vice president of human resources and support services for Saint Alphonsus, was unwilling to rest on the hospital's laurels: He wanted to keep raising the bar. He was hoping to create an incentive program for the hospital's 3,000 full-time employees, a program that would provide rewards based on attendance, anniversaries, employee retention, and service awards. That's when Saint Alphonsus turned to Chicago-based Hinda Incentives, a performance improvement company that has been creating programs for companies since 1970. The mechanism was an integrated reward and recognition solution to enhance performance throughout an organization using a cost-effective, Web-based program. As more HR functions go online, there is an increased interest in bringing incentive programs online, as well. Online technology is used most often for employee recognition, according to a survey conducted by Northwestern University's integrated marketing communications department at the Medill School of Journalism for the Online Incentive Council of the Naperville, Ill.-based Incentive Marketing Association. Up-front costs and maintenance fees associated with online programs typically are lower than old-style paper programs, primarily because online programs save on labor and printing costs. Also, one of the biggest benefits of an online program is that they offer immediacy that offline programs don't offer. A manager or employee can send instant feedback on a job well done. Michael Arkes, CEO and president of Hinda and past president of the Online Incentive Council, says it is easy to see why companies are going the online route. "We did an analysis of the charges for program administration and found that clients spent 15 to 20 percent of their total budget on paper-based communications due to the cost of printing," Arkes said. "Today, with Web-based programs, companies are only spending 2 to 3 percent of their total budget on communications. Today, technology is a given. Almost 100 percent of our customers have an online component in their program. It has become completely mainstream." He added, "We can add new products monthly, provide online specials, and that means participants will have a much better award selection than if they went to an annual paper-based catalog of the past. It gets them more involved in the program." Online incentive programs are becoming increasingly popular because they provide reward and recognition programs under one umbrella and provide a single, focused administration system. The online system employed by Saint Alphonsus uses a point system that allows employees to choose their own rewards--for service or major achievements. As far as administration, the program captures and reports performance data and creates tools to enhance performance reviews and award presentations. It tracks involvement and investment of managers in building employee relations and reduces the drain on valuable resources (time, staff, and money). Module #1 is the Performance Module, which includes safety, attendance, quality, productivity and customer satisfaction, training, referrals, ideas, sales, and others. Module #2 is Service Awards, which recognize annual service awards, performance, and other symbolic awards. Module #3 is Peer to Peer Recognition for on-the-spot awards that engage employees in recognizing peers who go above and beyond to reach goals, build teamwork, or service customers. Congratulatory e-mails are sent to recipients. Module #4 is Training. Its Tool Box has train-the-trainer modules to assist with the program's deployment, hands-on technology training, and individual program overview for supervisors and managers. The goal of the Saint Alphonsus program was to create a culture of recognition and reward to employees. The hospital previously offered other, individual recognition initiatives that ran independently of one another. This time, management wanted to allow for a global point-earning opportunity. The kickoff in January 2003 marked the first time the hospital would have a total recognition program to reward and recognize its employees and managers. Saint Alphonsus committed to an ongoing, three-year program. Other goals in creating a recognition system were increased participation in certain desired initiatives; allowing access to program and performance data and reports applicable to program participant and management personnel; providing a framework and methodology for consistent, timely, and meaningful communications; and to minimize time and costs associated with program administration. The online program integrates all dimensions of a recognition program into a complete information management system, which made the program easy for the hospital. The program uses a universal award vehicle and award point value system so employees can manage all of their different point-earning opportunities. The system is accessible on the hospital intranet, as well as via a URL on the Internet. 11. Extraordinary acts of kindness. All in all, these just add up to more of the many ways in which Saint Alphonsus continues to be one of the best employers in Idaho.